IO-Link Signal Tower – Visualize sensor information! 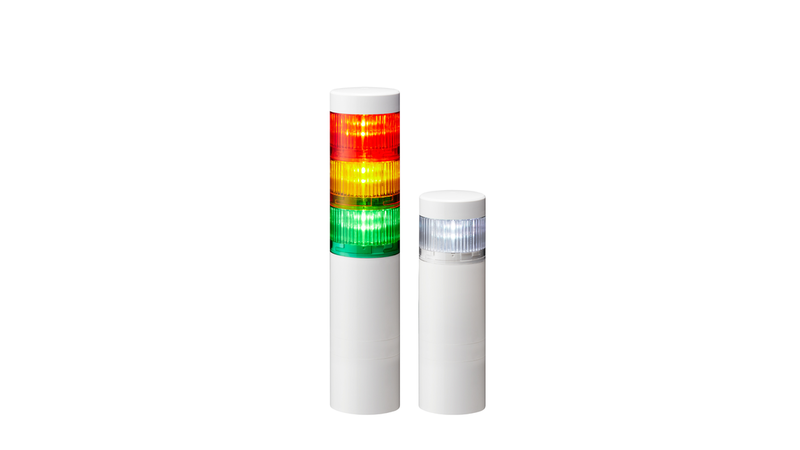 PATLITE’s LR6-IL IO-Link signal tower visualizes sensor information. Corresponding to the worldwide standardized IO-Link technology, this signal tower enables you to communicate with sensors and actuators. The M12 connector makes installing and replacing easy. The visual information is customizable by choosing up to 5 LEDs in colored calottes or one multicolor LED. Furthermore, the client can select the blinking and flashing patterns (continuous, slow blinking, middle blinking, fast blinking, single flashing, double flashing, and triple flashing). With a protection rating of IP65, the LR6-IL is suitable for use in areas with splash water and dust. In addition to the visual information, a buzzer with 81 dB and 4 alarm sounds supports you in triggering the correct response in case of a detected abnormality. The LR6-IL is also compatible with PATLITE’s WD system, which enables wireless data transmission. The Wireless Data Acquisition System is a cost-effective, IIoT-enabled add-on which allows signal towers to wirelessly transmit equipment status changes to a host PC for real-time monitoring and data analysis.